It may be the first time an NFL cheerleader has kneeled during the national anthem since Colin Kaepernick started a protest movement two years ago. 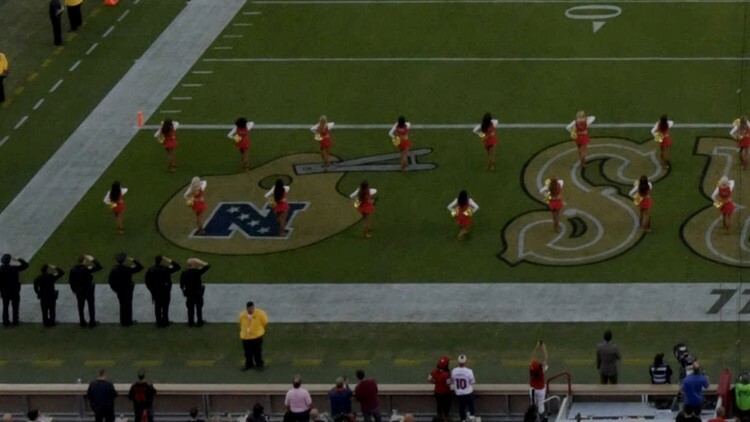 A San Francisco 49ers cheerleader took a knee during the national anthem before Thursday night's game against the Oakland Raiders. Although it wasn't immediately clear why she went down to one knee, it's believed to be the first time an NFL cheerleader has kneeled since the start of a protest movement initiated by former 49er Colin Kaepernick two years ago and repeated by dozens of players. At least two photos were shared on social media of the unidentified cheerleader kneeling in the end zone as her teammates stood during the anthem. It's not immediately clear what prompted the cheerleader to kneel, although players have cited racial and social injustice, and police brutality among their reasons for kneeling or sitting during the anthem. Taking a close look at bottom of this photo, you can see the cheerleader in the back row, fifth from the left. There was no immediate comment by the 49ers organization. The protests have become a sticking point for the NFL, which drew the ire of President Donald Trump last year. Trump has called for owners to fire players who kneel during the anthem, claiming it is disrespectful to the flag and to veterans. Vice President Mike Pence left a 49ers-Colts game last season, indicating he did so after several 49ers players kneeled. The Huffington Post, citing documents from the Department of Homeland Security, found that Pence's departure was pre-planned and cost taxpayers $325,000 for travel and security. The protests have been cited as one reason why NFL ratings fell in 2016 and 2017, although there are indications those numbers are rebounding this season. The NFL enacted a policy in May requiring players who were on the field during the anthem to stand, and that teams would be fined if players conducted protests. The league later put that policy on hold citing a need for further discussions with the players' union. Kaepernick has not been on an NFL roster since the end of the 2016 season. He's filed a grievance claiming NFL teams have colluded to keep him out of the league. NIKE went all in on the controversy this year, making Kaepernick the face of the company's iconic "Just Do It" campaign.